There's certainly no shortage of ways to travel around as a squid in Splatoon. You can choose to either just swim through your team's ink, tap on a teammate or Squid Beakon to super jump, or – in the single player mode – use a sort of powerline to quickly transport you from one side of the map to another. However, it appears that there was yet another form of warping that was scrapped at some point in development. As we reported on a couple months ago, a new art book for Splatoon recently launched exclusively in Japan. Featuring over 300 pages of artwork and information on the game, the book naturally is filled with interesting trivia on the game. 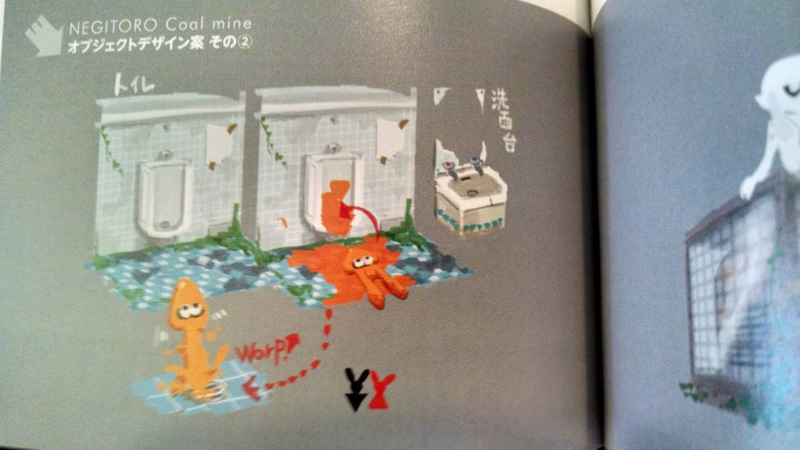 A picture was spotted which seems to indicate that at one point, there was to be a warp system where inklings would be able to jump into urinals or sinks and be ejected out another one somewhere else on the map. Doubtless, Nintendo removed this due to it being somewhat lowbrow humor, but nonetheless it would've been an interesting inclusion. What do you think? Do you wish Nintendo left this is? 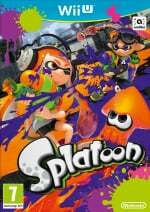 What ideas do you think could be utilized in Splatoon's inevitable sequel? Drop us a comment in the section below. When pictured going into a urinal, those squids suddenly looks pretty damn phallic. Especially that light-orange one. It's probably best that they didn't go through with this. I think it's a great idea. Its hardly offensive and it's a nice humorous touch that makes sense in the world.....I'd love to see this pop up in a later sequel or even a map release in an update!?! Urinals as warp zones. Why they remove warp zones? At least they could've put warp 'pipes' as warp zones. I wonder if Nintendo will ever release this artbook here? Who cares about the urinals,I want to know about that ghost on the right. Wow, that orange Inkling changed color when he/she's got out of warp zone. Still waiting for mine to arrive. They sent my order (Splatoon Soundtrack + Artbook and TWEWY soundtrack) a week ago. I hope it won't take as long as my previous order from CDJapan which arrived 2 months after being sent. Not a big fan of the urinals, but they should have added warping. There are fountains in single player that you ride up, they could have made drains you could warp thru. A few things though. 1, where would the urinals be? The entire game takes place outside, that makes no sense. 2, the jump system gives you spot on travel, going via a warp pipe how would we know where we came out? Trial and error wouldn't be fair for newvomers. 3, it would be cheating, getting somewhere without effort. The current system allows you to advance after a team ate gets ahead and puts down a beacon, if it were already there you could just move forward. Now I suppose they could make a warp pipe you paint and could only use after you inked it. Yeah, that would work. 4, But then, camping. 1 person on the other team could just shoot anyone coming out, so no. Best they didn't include warp for camping alone. The beacons work better, plus jumping is cool. I would like to see the power lines in multiplayer. A network of overhead wires mith numerous endings, too many too camp them all, like an overhead spiderweb. But if camping is a pronlem, invisible objects are a must. And those sponges could be great for spanning areas in Camp Trigger fish or Moray Towers. And the fountains for vertical travel in areas, just because they are cool to look at. Oh well. Well Mario goes down sewer pipes, so this idea is very amusing. Shame it didn't make it into the game. So one of the (many) Harry Potter transportation systems, basically! I'm kinda glad that this wasn't in the game since this sort of humour doesn't really appeal to me. Plus, it's kinda gross. Pretty cool idea, but with squidjumping, we don't really need it for instant transportation. oh using a toilet, ok. that's sorta gross, but cool? @datshantaeguy In Banjo Kazooie you get flushed down a toilet into a pipe full of s***. This would definitely fit into a Banjo game. Splatoon's inevitable sequel? How could they possibly come up with new concepts to keep the series FRESH? I for one am glad that this idea got canned... no pun intended. I don't think it would really match the atmosphere of the game at all. Super Jumping and the single player mode ziplines are good enough transportation for me. It doesn't bother me ether way. I had hoped a sequel would be bigger in some way. The fact they have the bones to slide into any shooter mold means they have plenty of options if they maintain the right tone. Might be weird, but I gotta admit, it's actually a pretty funny and clever idea considering how the squids can slip through things like that in the game. it'd make sense they could do it with sinks and toilets too.